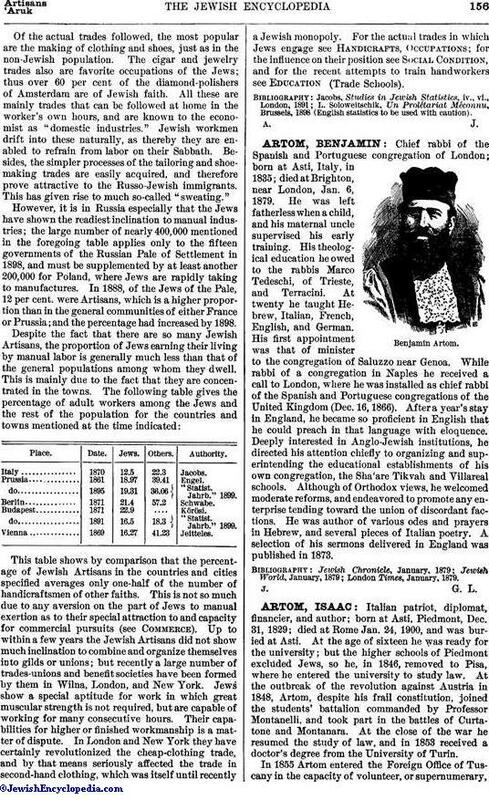 Chief rabbi of the Spanish and Portuguese congregation of London; born at Asti, Italy, in 1835; died at Brighton, near London, Jan. 6, 1879. He was left fatherless when a child, and his maternal uncle supervised his early training. His theological education he owed to the rabbis Marco Tedeschi, of Trieste, and Terracini. At twenty he taught Hebrew, Italian, French, English, and German. His first appointment was that of minister to the congregation of Saluzzo near Genoa. While rabbi of a congregation in Naples he received a call to London, where he was installed as chief rabbi of the Spanish and Portuguese congregations of the United Kingdom (Dec. 16, 1866). After a year's stay in England, he became so proficient in English that he could preach in that language with eloquence. Deeply interested in Anglo-Jewish institutions, he directed his attention chiefly to organizing and superintending the educational establishments of his own congregation, the Sha'are Tikvah and Villareal schools. Although of Orthodox views, he welcomed moderate reforms, and endeavored to promote any enterprise tending toward the union of discordant factions. He was author of various odes and prayers in Hebrew, and several pieces of Italian poetry. A selection of his sermons delivered in England was published in 1873.